Wi-Fi RTLS can solve many problems found inside a hospital today. WIth Wi-Fi RTLS, assets and people can be tracked inside the hospital. Shrinkage can be reduced and accidents can be prevented. Wi-Fi RTLS has many benefits for all types of industries, but the benefits it can provide to healthcare are immensely valuable. Just about every piece of valuable equipment in a hospital is mobile or on wheels. Finding the right equipment can sometimes be a complete task all in itself since the location of the equipment may be unknown. A simple remedy to the problem of finding equipment is to have a system that knows the whereabouts of all equipment at all times and anywhere on the campus. With Wi-Fi RTLS, you can have an asset tracking solution for locating equipment using a Web browser, even when equipment is locked behind closed doors. Reduce shrinkage, costs of equipment rentals and eliminate staff time spent searching for equipment by making your assets visible at all times. By leveraging a hospitals existing Wi-Fi network, Wi-Fi RTLS locates all tagged patients at any time, anywhere within the footprint of the network. 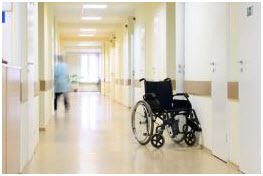 If a patient is in his room or on his assigned floor, RTLS will locate them. Should a patient walk into the fire escape, Wi-Fi RTLS will alert staff and security about the event. These are just three major benefits to Wi-Fi RTLS in healthcare. There are many other ways to utilize RTLS. Interested in Wi-Fi RTLS for your hospital campus? Contact us for a free consultation to get started or download our free Hospital wireless design guide.